SUN ARK is the ultimate thrill ride! Speed, luxury and comfort combined with five star service. Guest Accommodations are for eight guests in four well appointed ensuite double staterooms. Master Stateroom is located below deck amidships and features a King bed,entertainment system with Flat screen TV, and a large ensuite bathroom w/bidet & toilet, Jacuzzi Tub & Shower. 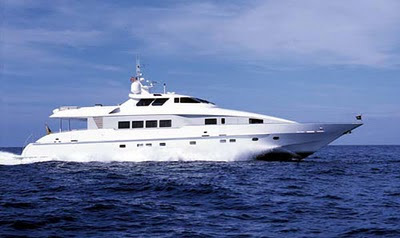 3 guest staterooms located below ; two with Queen beds and 1 with Twin beds all with ensuite bathrooms and shower.